Click on the image above to see it at a larger size. A $41,205 Massachusetts Board of Library Commissioners Planning and Design Grant was awarded to Tilton Library in August 2014. A required $20,600 supplement was funded by Tilton Fund, Inc. Shortly after the award was announced, library trustees appointed a seven member Needs Assessment Ad Hoc Committee which interviewed and recommended an owner’s project manager and an architectural firm. The firm, Johnson Roberts, Associates, Inc. of Somerville has prepared an initial design using the approved and accepted library building program. This initial design and results of site studies were used to apply for a Massachusetts Public Library Construction Program Construction Grant Round in January 2017. At the July 13, 2017 meeting of the Massachusetts Board of Library Commissioners, the Deerfield project was placed on the Waiting List, with a rank of #12 of 24. 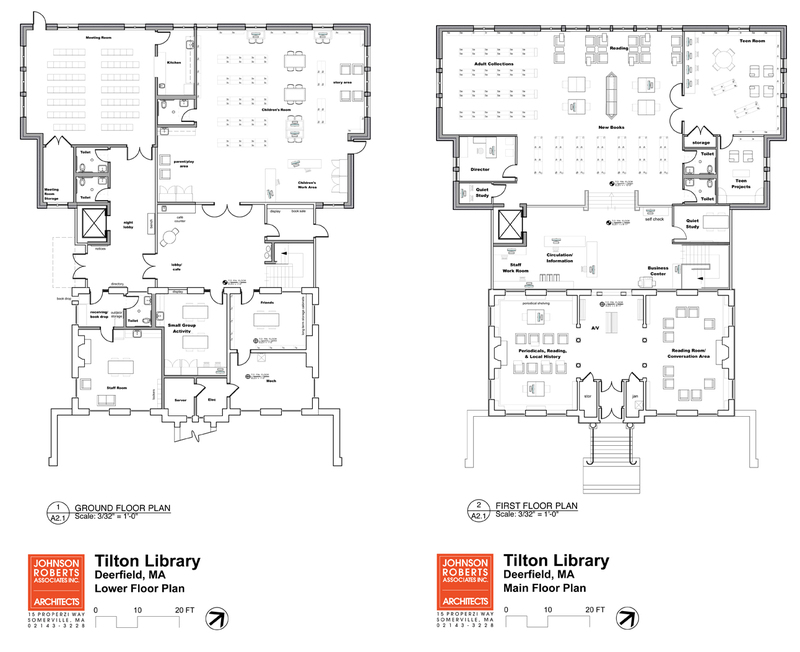 When funds become available through the state’s annual capital budget, a $3,944,338 provisional grant award will be made for Tilton Library’s construction project. Please feel free to send us your feedback about the project. Click on this text to be taken to a feedback page. All submissions will be forwarded to the Building Committee. We thank you for your input.